So when we rediscovered the fig jam we bought on our Croatian holiday in our cupboards, we were revisited by all the memories of the beautiful food we ate there. 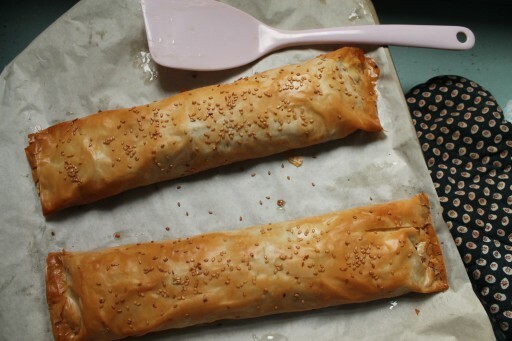 One of the things we tried was burek – pastries that originate from Turkey but are found all over the Balkans. We loved them and they reminded us of other “parcels” like samosas, pasties, spanakopita, pierogis, empanadas and Jamaican patties. You can fill burek with all kinds of filings, including minced meat, cheese and spinach, even custard like they do in Greece. We also like to eat the burek with lots and lots of hot sauce, but you could eat them with sour cream, yoghurt or even some Indian pickle. Don’t you just love street food that you can make at home? Preheat the oven to 180C (fan-assisted). Remove the lamb from the heat and set aside to cool slightly. Lay out one sheet of filo horizontally and brush the sheet lightly with olive oil. Lay another sheet on top and repeat. On the longest edge of the filo sheet (either the top or the bottom), spoon half of the lamb mixture in a sort of straight line along the edge and about 1 inch from the edge. Fold the 1 inch over the lamb. Very carefully, roll the filo and lamb upwards or downwards (whichever edge you chose) to form a long tube so that all the filo is used up. Tuck in the edges so that the lamb is fully encased. 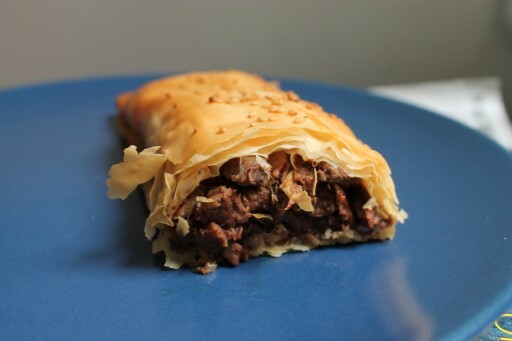 Lay the burek on a baking sheet lined with greaseproof paper. Do the same with the remaining filo and lamb. Place the baking sheet in the oven and bake for 20 minutes until golden.